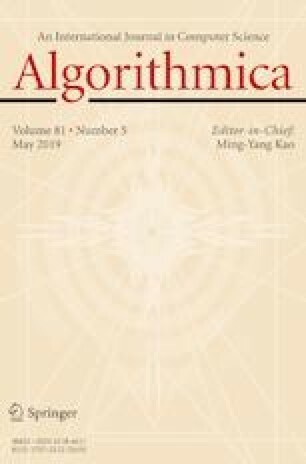 We consider the stable matching problem when the preference lists are not given explicitly but are represented in a succinct way and ask whether the problem becomes computationally easier and investigate other implications. We give subquadratic algorithms for finding a stable matching in special cases of natural succinct representations of the problem, the d-attribute, d-list, geometric, and single-peaked models. We also present algorithms for verifying a stable matching in the same models. We further show that for \(d = \omega (\log n)\) both finding and verifying a stable matching in the d-attribute and d-dimensional geometric models requires quadratic time assuming the Strong Exponential Time Hypothesis. This suggests that these succinct models are not significantly simpler computationally than the general case for sufficiently large d.
Part of this research was conducted while visiting the Simons Institute for the Theory of Computing, Berkeley. This research was partially supported by the Army Research Office Grant Number W911NF-15-1-0253. This research is supported by the Simons Foundation. This research is supported by NSF Grant CCF-1213151 from the Division of Computing and Communication Foundations. Any opinions, findings and conclusions or recommendations expressed in this material are those of the authors and do not necessarily reflect the views of the National Science Foundation. The conference version is available at Springer via https://doi.org/10.1007/978-3-319-34171-221. We would like to thank Russell Impagliazzo, Vijay Vazirani, and the anonymous reviewers for helpful discussions and comments.